Flexible Feeding is the name, and allow the farmer to send feed from any feed silo to any cage – without any manual handling. The system makes it easier to use different feed types and sizes, and allows for easy expansion of existing feed systems with more feed lines, without expensive rebuilding of main feed silos. 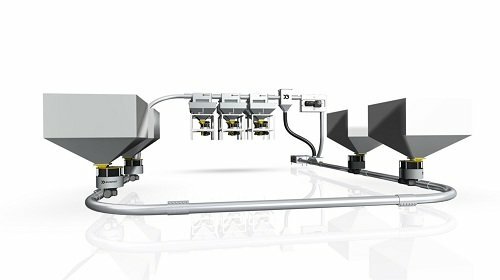 Flexible Feeding is a revolutionary new add-on concept to the well known Akvasmart CCS Feed Systems. In Norwegian salmon farms, typically 8-12 smaller buffer-silos with weighing cells are installed inside the feed barge – one for each 160m circumference cage (no selector valve) – and the main feed silos are no longer connected directly to the feed lines. A high capacity conveyor system then moves feed from the main feed silos in order to keep the buffer-silos full automatically. From there, the feed is fed through the normal central feed system to each cage. It is also possible to install selector valves after the buffer-silos in case there are more cages than feed lines. – The system makes the entire feed logistics and calibration far more efficient and allows easy access to different feed types and pellet sizes, says Senior VP of Technology and Development in AKVA group, Mr. Trond Severinsen. Flexible Feeding can be adapted to both new and existing feed barges, and is sold as an add-on to AKVA group’s well known central feed systems. Several rebuilds and new installations are already in operation in Norway, and two big feed barges with double conveyors are being delivered during 2018. – Customers investing in Flexible Feeding will be able to achieve higher feeding capacity and major time savings. Today in Norway, each cage is normally connected to one specific feed silo via one single feed line. This means it is time consuming to switch feed pipes, calibrate and move feed from one silo to another, in case running out of feed, having technical problems or want to level off the barge, adds Severinsen. The conveyor system that moves the feed from the main feed silos to the buffer-silos is developed by the American supplier Cablevey. They have supplied more than 30.000 systems over the last 40 years to major food producers worldwide. 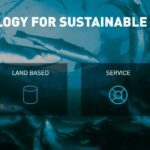 This is however the first time the system has been designed and used for large scale industrial fish farming, for which AKVA group is the exclusive global distributor. The entire system is controlled via AKVAconnect in the feed barge control room. This is now thoroughly testet in AKVA group’s development and testing facilities in Norway, in addition to several pilot projects with our customers during the last year. The results are very good and the system runs reliably. The feed is gently and efficiently being transported at high speed from the main silos to the buffer-silos. We are also very pleased that the system easily can be adapted to upgrade existing systems as well as installed in new feed barges. This means a win-win situation for both AKVA group and our customers, concludes Severinsen, and adds, there will be more new and innovative solutions coming from AKVA group’s new Technology and Development department going forward.